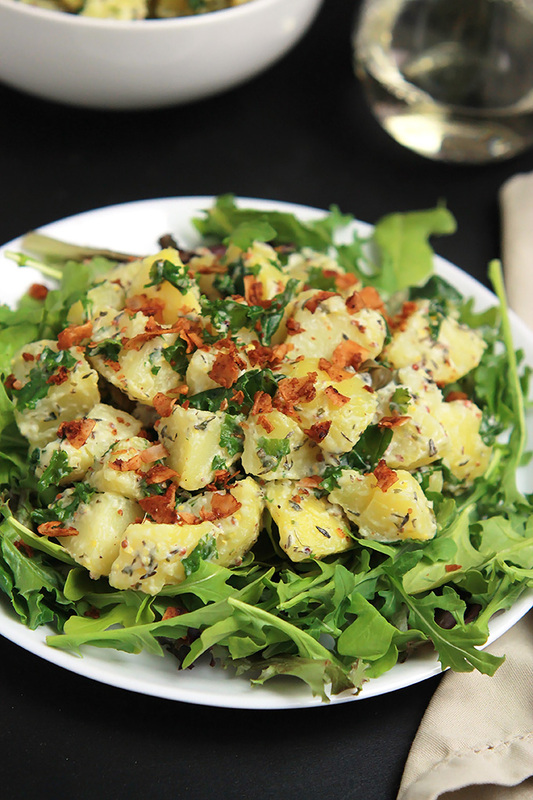 Vegan Yukon Kale Potato Salad-Sweet golden potatoes and chopped kale tossed together in a creamy dressing, garnished with a sprinkling of coconut bacon. A delicious twist to a traditional summer side for the vegetarians or vegans in the crowd. 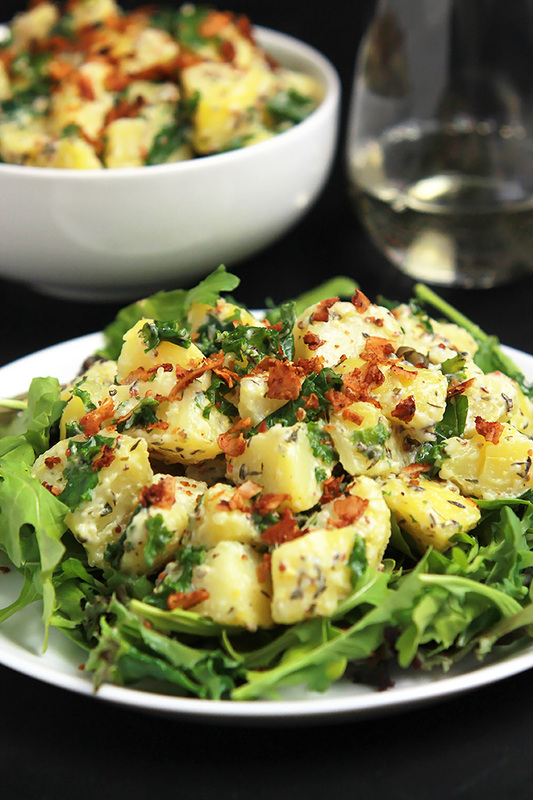 Warm weather gatherings around the grill almost always include the traditional potato salad, so why not offer your guest some variety. 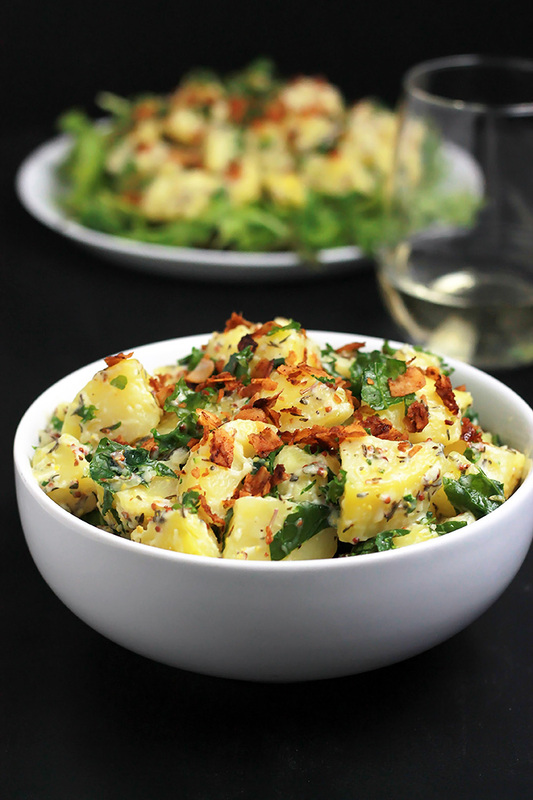 This isn’t your typical potato salad, no eggs or loads of mustard, not that there is anything wrong with the traditional. Why not give yourself and your guest some variety and if you have any vegans in the group they will be happy to have one for them on the table. Easy, easy, easy, this salad is so easy to make. I chop my potatoes before boiling so they cook faster and aren’t all mushed out when I tossed them in the dressing. While the potatoes are boiling chop the kale and mix the dressing. Once the potatoes have cooled slightly just toss, garnish and serve. For an extra bit of flavor I garnished my salad with a sprinkling of smoky coconut bacon just before serving. You can find the recipe for the coconut bacon HERE. When I serve the salad alone I always serve it on a bed of greens with an extra serving of the dressing on the side. If using coconut bacon, prepare and set aside. Wash and peel the potatoes using a vegetable peeler. Dice potatoes into 1 to 1 and 1/2 inch size and place in a large bowl of cold water. When all to the potatoes are diced, pour off water and rinse with fresh cold water. Place potatoes in a large stockpot and fill with cold water to cover potatoes, about one inch above potatoes. Bring to a boil, reduce heat to medium and boil 10 to 15 minutes, or until potatoes are fork-tender and cooked through. Remove from heat and strain off water, place potatoes in a large clean bowl. If you prefer you can use the boil and peel method, which is to clean and boil unpeeled potatoes until fork-tender and cooked through. Remove from heat and pour off water. After potatoes have cooled enough to handle, remove the skin of the potatoes with your fingers and dice. While potatoes are boiling prepare the kale and dressing. Wash and remove the kale from the stem, chopped kale to about 1/2 inch pieces. Place kale in a bowl, drizzle the olive oil over the kale and sprinkle with a small amount of sea salt, about 1/8 teaspoon. Message the kale with clean hands for about 30 seconds, this make it more palatable. In a small bowl mix together the dressing ingredients until well combined. 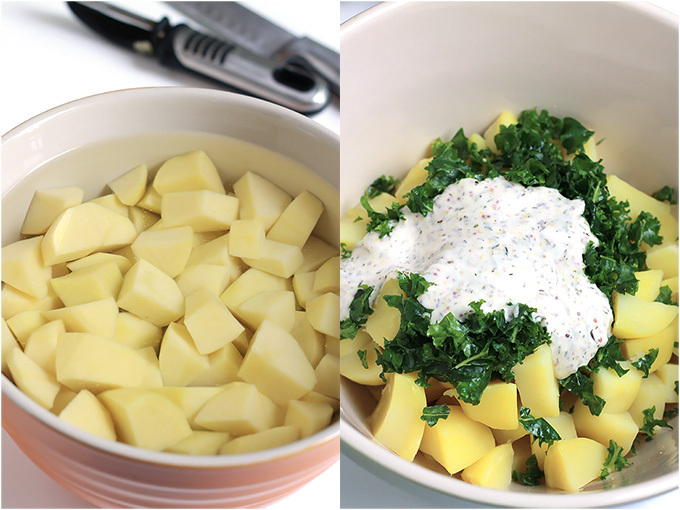 Place the kale and dressing in the bowl with the potatoes and gently toss until combined and all of the potatoes are coated. Serve immediately allowing guest to sprinkle coconut bacon on their serving or store in the fridge in a covered container until ready to serve. If you make this recipe or a version of it, take a picture and share with me on Instagram, tag it #thewholeserving or leave a comment below. 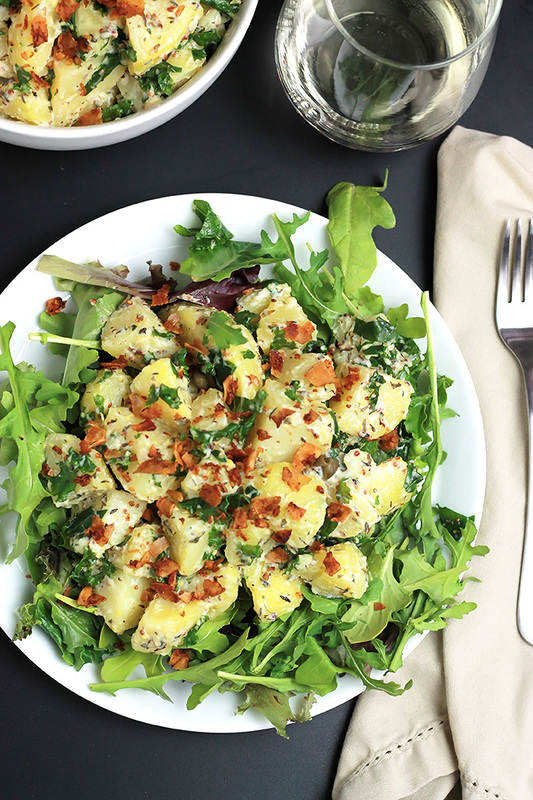 I’d love to see or hear about your version of Yukon Kale Potato Salad. This looks so perfect and yummy! Thanks Kim. I checked out your new link party and left a link. I think it’s a nice twist on link parties. You have such exotic ingredients in your recipes. What is coconut bacon? I love this stuff. Can’t wait to move to the US to try all of these. All we have here is too much olive oil! Your photography is exceptional Celeste! Thank you so much Mary. Coconut bacon is a sub for real bacon for vegans. It’s coconut chips tossed in seasonings and a bit of sauce that has some liquid smoke to give it a smokey flavor. It is so good and I love having handfuls with almonds or cashews for a snack sometimes. I hope you have a chance to try soon. 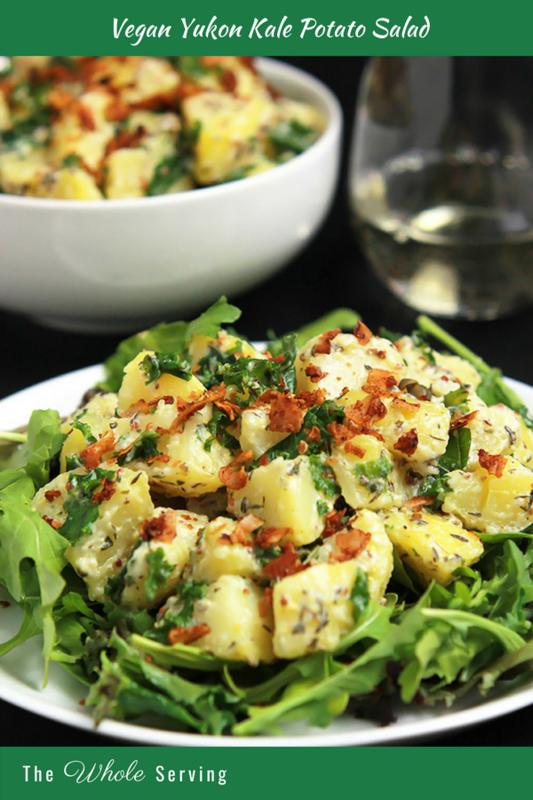 I love this idea, of serving the potato salad on a bed of greens, that arugula with give it a bit of peppery flavor! 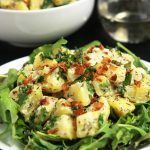 I’ve always used either white or red potatoes for this salad, but these yukon give it such a rich look and I bet the flavor it awesome! I’m going to try this, soon! The yukon potatoes gies it a creamy, butter taste. Sometimes I like to put potato and pasta salad side by side ona bed of greens. So delicious. Thanks so much Heather, I really appreciate you featuring my Yukon Kale Potato Salad. This looks absolutely INCREDIBLE! Yukon gold potatoes are my favorite potatoes (they are right in alignment with my love for sweet potatoes! ), and I usually have them warm. I’ll have to try this for summer. 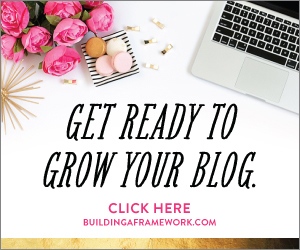 Thank you for the great recipe, and I just love your blog! Heather thank you so much for leaving me such a kind comment. I certianly hope you enjoy this salad as much as me and my family. Thank you for sharing this on Peace, Love, Link up! 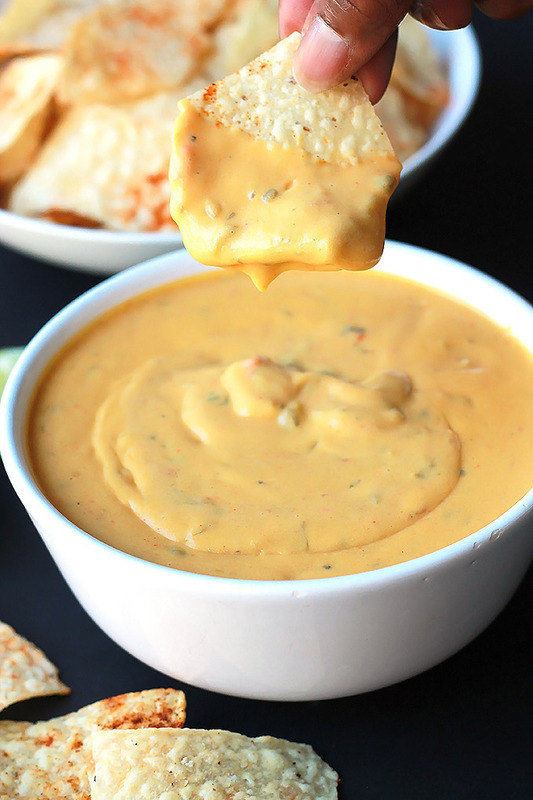 This recipe caught my eye not only for looking delish, but for being vegan as well. One of the problems I run into when trying a vegan lifestyle is lack of varity. This post has my mind spinning with possibilities!